Dense wavelength division multiplexing (DWDM) is one of the most important technologies to increase network transmission capacity. Early DWDM systems applied fixed wavelength DWDM SFP+ transceivers and performance is good. However, as the demand for great traffic capacity keeps growing, more optical transceivers of different wavelengths are needed, leading to high cost. So how to deal with that? 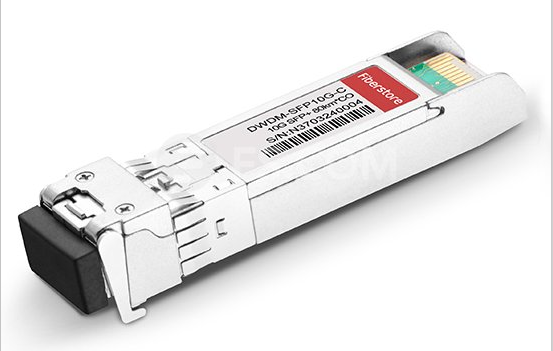 DWDM Tunable SFP+ arises your attention. Conventional DWDM SFP+ transceivers use fixed-wavelength lasers as light sources. It means that many optical transceivers are needed for the wavelength channels in a DWDM system. While DWDM tunable SFP+ is different from fixed wavelengths modules because it applies tunable laser, which can operate at any channel wavelength, means that only one kind of transceiver is needed. Tunable lasers are now widely used as light sources in DWDM systems. Tunable SFP+ modules are only available in DWDM since CWDM grid is too wide. DWDM Tunable SFP+ optics are for the C-Band 50GHz. About 88 different channels can be set with intervals of 0.4nm, which is the 50GHz band. For better understanding, I’ll show you a DWDM tunable SFP+ module. This is a Cisco Compatible 10G DWDM C-band tunable SFP+ 50GHz Transceiver. It’s hot swappable, can support 10.3Gbps data rate up to the distance of 80km over single mode LC fibre cable. Support 1563.86nm-1528.77nm C-band tunable wavelengths. What you should note is that wavelengths of DWDM tunable SFP+ can be tuned only when your Cisco/Juniper/Arista/etc switch supports. If your switch only supports common fixed-wavelength DWDM SFP+, you need external software to change tunable optics into certain wavelength before putting into use. Why DWDM Tunable SFP+ Is Better Than Fixed Wavelength SFP+? Fixed wavelength SFP+ are still in the market and not too many problems found in use. So you may feel puzzled about choosing DWDM tunable SFP+ or fixed wavelength SFP+ as tunable SFP+ is more expensive. The following will tell you why you need tunable optics. First, save you cost. With the development of optical communication systems, the shortages of fixed-wavelength laser gradually revealed. Conventional DWDM SFP+ can lead high costs. The number of wavelengths in DWDM 50GHz has reached the hundreds. Then spare modules of each laser should be prepared for protection of the system because you don’t know which module will break down and it’s difficult to predict the number of stock in specific channels. Therefore you have to buy large quantity of DWDM SFP+ modules with fixed wavelengths. While the tunable optics are configured with different DWDM wavelengths in one module. You can select the right wavelength you need based on your optical fibre communication environment. DWDM Tunable SFP+ are typically used as “spare-optics” to save you cost. Second, flexible network management. When running a DWDM network with lots of nodes, for instance, up to 80 different wavelengths, management could be a nightmare. You have to prepare couple of DWDM SFP+ optics of each wavelength and possibly in different locations. Field engineers may not access network nodes as quickly as you wish. Thus DWDM tunable optics would be a good choice. Tunable optics could be configured for a specific wavelength to support bandwidth changes as needed in the optical network. Third, suitable for large network capacity. As the development of increasing network transport, 400G or 1T would be the trend. Then 400G and 1T transmission formats are expected to be bulky and not fit within 50GHz spacing. These future new data rate formats require that channel spacing is flexible, that your OTN system can adapt to new rates and can re-arrange channel spacing to find place for new rates in it. DWDM Tunable optics will double the number of channels supported in this transceiver module. Upgrading to 50GHz channel spacing doubles the capacity potential in Enterprise and Metro networks. DWDM Tunable SFP+ are high-performance optics which can be tuned to the appropriate wavelength in seconds. The ability to function on various wavelengths has set these optics apart from fixed-wavelength DWDM SFP+. DWDM Tunable SFP+ will become popular among DWDM systems due to their ease of spare use and flexibility. Tunable SFP+ would be a powerful and invaluable transmission tool in high-speed network. 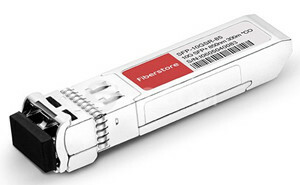 At present, many engineers are using fixed wavelengths SFP+ transceivers. Some may be stopped by the DWDM tunable SFP+ price. But in the long run, you are suggested to consider tunable SFP+. This entry was posted in Fiber Optic Transceivers and tagged DWDM SFP+, DWDM Tunable SFP+, tunable SFP+ on November 1, 2017 by laura.